LIHUE — Even the smallest gesture can go a long way. The YWCA of Kauai received a donation of five bicycles as well as helmets and reflective bands Wednesday. “The YWCA is always grateful to have any kind of support from our community, the county and the Bikes on Rice program,” said KipuKai Kuali’i, YWCA of Kauai director of operations. The bicycles will go toward helping the YWCA’s clients. “Some of the bikes will be going to our shelter program. A lot of those clients are without their own transportation,” said Mia Carroll, YWCA of Kauai shelter director. 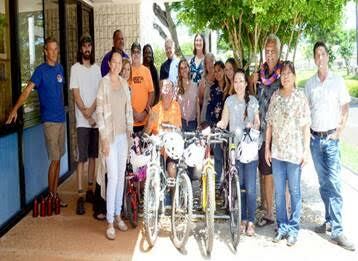 The donation was put together by a group of people from Get Fit Kauai’s Bikes on Rice program in collaboration with local shop Briggs Bicycles. “The way it started, I have a lot of bicycles. I go in there and hang out with (Briggs Bicycles owner Briggs Knott) and learn how to work on my bicycles,” said Jim Benkert, Bikes on Rice program coordinator. Benkert added he’s got a handful of other bikes he’s working on that he hopes to donate. As for Wednesday’s donation, he just hopes they’ll be of use to people who need them. “We don’t know, as bike shop guys and bike riders, who needs these the most. They (the YWCA) deal with people every day who have needs that we’re not equipped to identify. They are,” he said. See the original article online at The Garden Island.